You are bothered of typing long web addresses on your mobile phones virtual keyboard, just to open the same address, which you have already open on your computer? This Bookmarklet allows you to generate a QR code of a websites URL, just by a click on the button in your browsers bookmark bar. 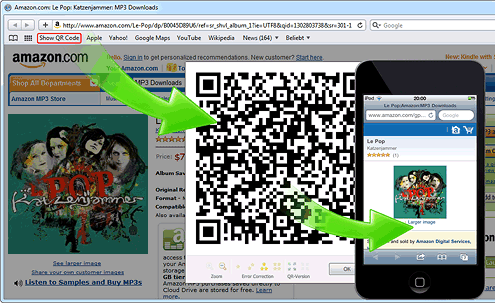 Scan the QR code using your mobile phone to get the URL on a much easier and faster way to your mobile device. To scan the codes, I recommend the free decoder software Qrafter (Kerem Erkan • Apple AppStore), QR Reader for iPhone (TapMedia Ltd • Apple AppStore), Scan (QR Code City, LLC • Apple AppStore), or i-nigma (3GVision • Apple AppStore, Android Market).